The FME humidity detector can determine the absolute humidity in wood, building materials and even in paper with high accuracy. This humidity detector comes with a connection for external sensors which can either be inserted in the material or placed on it. Its additional external temperature sensor allows automatic temperature compensation. This detector corrects the measured humidity value in real percentages in relation to the selected material and the temperature (according to dry/absolute humidity). The FME humidity detector for building materials is the ideal tool for the control of building materials such as: pavement, cement, gypsum, mortar, concrete and diverse wood types (it depends on the sensor). The detector is also suitable for technicians and builders to measure humidity on site and to determine humidity in walls, floors, etc. The detector has characteristic curves for different materials which can be recovered at any time. 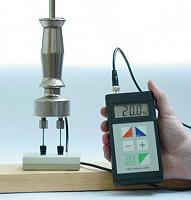 It is important to choose a humidity probe that best suits the material which is going to be measured. There are different models for different applications and materials. 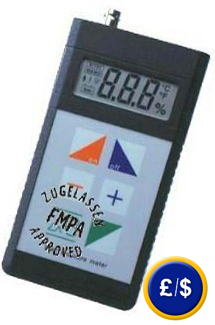 The FME humidity detector can be used for all kinds of measurements. With the FMC humidity detector for building materials it is possible to determine with high accuracy the real moisture content by introducing the corresponding characteristic value of every material (for the characteristic curve of the stored material) in the detector. Some charts with more than 500 characteristic values for wood, building materials and paper will be included in the delivery. Temperature must be taken into consideration. As the temperature of the material influences its electric power capacity (and also its humidity), a temperature compensation has to be carried out. It can be adjusted in the detector with 1°C intervals (manual compensation). Below you will find the characteristic curves in alphabetical order of all the most important wood types, building materials and paper types (500 values are stored in the humidity detector to be recovered at any time). We can also send another list with more information. Measuring values will be higher in chips or knots. On the contrary, if measurements are taken on breaks, the humidity value will be lower in relation to the real humidity value (absolute humidity). In both cases, you should measure near the area which is going to be measured and use the mean value. The result will not be affected if measurement is taken either in the fiber direction or against the fiber direction. 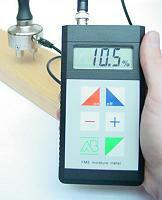 Here you will see a wide range of probes which can be adapted to different measuring instruments. You will be able to choose the probe that best suits your needs. We would be pleased to advise you on the information you need. Contact us: UK customers +44(0) 23 809 870 30 / US customers +1-410-387-7703. It is used to hook up all the special sensors: head sensors for surfaces (to measure without causing damages in the material), surface sensors with short and extra-long pins. It is hooked up with both plugs to the universal probe holder. Humidity is measured in the black measuring surface. This contact sensor works without causing any damages to the material. It is specially suited for measuring humidity on printed wall-papers, plastics, valuable woods and other building materials where it is important to measure without causing any damage. It is hooked up with both pins to the universal probe holder. Humidity is measured with 4 x 1.5 mm length pins on a rounded metal surface divided into two parts. It is suitable for measuring the moisture content of cork, rubber, soft building materials and roof insulators. It is hooked up with both pins to the universal probe holder. Humidity is measured with 4 x 17 mm length pins. It is specially suited for gypsum, cement walls, pavements, lime-stones, materials for junctures, isolation materials, panels. It is hooked up with both plugs to the universal probe holder/humidity is measured by the two ends of the pins/suitable for big diameter woods, beams, timber planks as well as for diverse insulation materials and fibre or for light building foam materials. The humidity detector for building materials has an automatic temperature compensation by connecting the temperature sensor to the main unit.